Many years ago our family would vacation in Ocean City, New Jersey, during the week after Labor Day. My father-in-law and I would try our luck at the 12-hole par-3 municipal course near the airport. I never worried too much about forgetting to wear sun block while playing there, but only a complete fool would golf at Ocean City without slathering on the insect repellant. That’s because the course sat hard by the marshes on the west side of the island, with many of the holes bordered by phragmites. Let’s just say the flies and mosquitoes added a certain dimension to the game. There have been some advances in bug-fighting technology since then, and Cape Region golf courses do what they can to keep their layouts inviting for their players. Chris Adkins, the head superintendent/co-owner of The Rookery, uses two basic techniques. In the early morning before the breezes start, Adkins makes a circuit of his Milton-area layout with a special fogging machine. The gas-powered pump sprays a highly-diluted solution of Biomist® insecticide to kill mosquitoes and several kinds of flies. 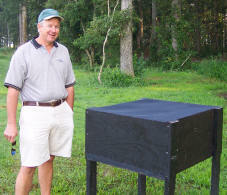 Chris Adkins stands next to one of his fly box traps near the practice range at The Rookery Golf Club near Milton, Delaware. Adkins also takes advantage of the flies’ limited brain power with a non-chemical device. Near his practice range sits a fly box trap, essentially a black-painted box that stands about a yard above the ground, with a screened top and a wedge-shaped screen underneath, similar to a crab trap. Adkins found out about the boxes from a place in Maryland, and then built one himself. “The flies sense the heat of the box, and the shape makes them think it’s an animal. They fly underneath, as if it’s the belly, and then crawl up through a slot and into the box. They can’t figure out how to escape, so they’re stuck,” Adkins grinned. When I checked it, there were a few hundred specimens, mostly already dead, lying in the trap. 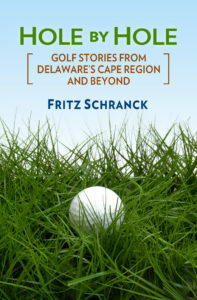 Rob Marshall of Old Landing Golf Club, outside Rehoboth Beach, agreed with Schneider’s assessment. “We’ve had a couple days this year when it was bad, but mostly it’s not been too bad. Now, years ago they’d take you away from here. The only time we have ‘em show up now is when it’s real hot, real humid, and there’s no wind. But we almost always have a breeze, and even when we don’t, the mosquitoes are only noticeable in the early morning and around dusk,” he said. I wouldn’t suggest that Cape Region golfers throw away their bug spray or Skin So Soft® any time soon, even if the mosquitoes aren’t as bad as in other years. Considering the West Nile virus risk, however, it’s good to know that local course managers aren’t ignoring the problem. Congratulations to Reinie Vugrinec as she begins her college golf career this fall at Old Dominion University, in Norfolk, Virginia. Vugrinec, a 2001 Cape grad who lettered on her high school team, just completed her freshman year at the University of Maryland-Baltimore County. She accepted a scholarship to play for UMBC last year, but unfortunately that school eliminated their golf program just as she was about to join it. ODU women’s golf coach Pat Kutten signed her up for the school’s inaugural season, which begins September 5 at a tournament in North Myrtle Beach, South Carolina.